Fishing report by Max Sardi, Who was until recently director of fishing manager at farlows tackle shop, pall mall, London. 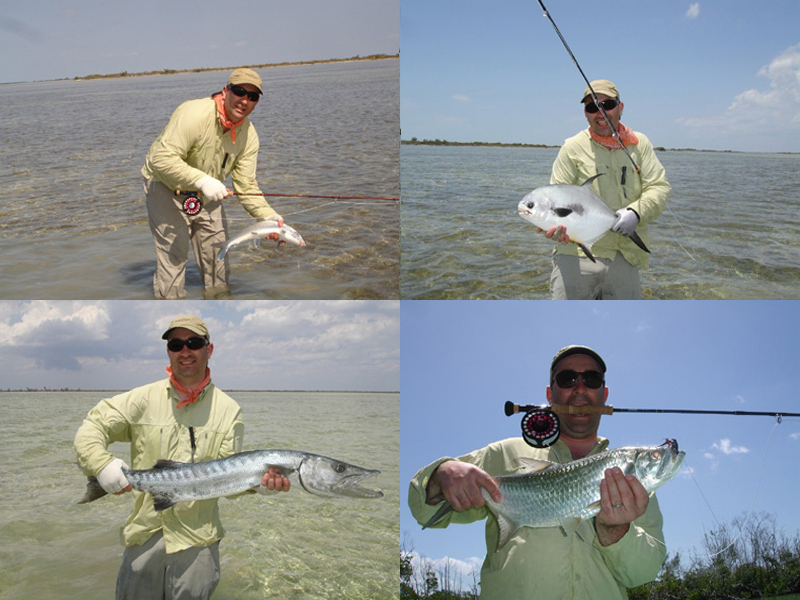 “I was really looking forward to fishing in Cayo Romano as it is very much an untouched area, almost virgin. We drove for about two hours to Januru near to Camaguey, a small working sugar cane village and we stayed at the Hotel Brasil. This place is a special mansion that was built in 1929 for the owner of the sugar cane factory near by. It is a traditional colonial house with 8 bedrooms all with air conditioning, a real fisherman Lodge with nice nestaurant and bar lobby and really friendly staff. We started early and it took us about 50min. driving to the fishing. Once we arrived at the dock it was really nice to see that they have in place 8 brand new boats (Mitzi skiffs) ready to go; my guide for the three day was the head guide Heribe. Cayo Cruz fishery has access to 3500 square km's of fishing so you can just about imagine the scale of the place. They told me that they have only explored about 30% of the area and every day they go out without anglers to get to know the area and marked the best fishing spots and record what type of fish they see. I felt privileged to have been invited to come and fish such a paradise, Willy tells me only about 30 people have been fishing here since this area has been open to sport fishing....!!! Where do you start....??? Early morning and the sea its like milk pond flat as pancake and 32degrees, boiling hot; we head out to the La Casa del Sabalo (The House of Tarpon) they call this spot because its becoming quite famous for big Tarpon; this place is like the flats in the Florida Keys, about 2 metres of water with nice dark places with light sand between so making it easy to spot the fish coming in with the tide, you can see them arriving about 200m away from you and my guide places the boat at an angle ready for me to cast with my G.Loomis 12WT with Tibor Gulfstream reel and Rio gost tip flyline ready to go..... It's 7:35am and my knees are shaking like a leaf. I see this group of Poons coming towards me and they look happy, I make my cast about 50 feet to cross the path of the incoming fish and just like that, the Poons somehow just make a U turn about 10 feet from my Fly..!!! What do I say...? Ok so these guys are wise and they know we were there. Aribe, my guide, said they are very shy fish when you fish them in shallow water and they can sense vibration from the boat really easily. So we move on to a new channel much deeper with blue water and this way the routes that the Tarpon takes on an incoming tide to enter the lagoon, so we wait for about 25 min. and then there they wrae rolling and jumping out of the water. I get ready again and I make my cast down tide so the water will bring my fly to them, this time they have to see it. Right on cue...BANG, this fish grabs my fly and comes straight out of the water like they do and I knew this fish was hooked well and he starts taking backing really fast heading off shore just not even a mile from where I hooked; I played the fish for about 10min. and my leader just got bitten off by the fishes jaw. My bite tippet was 125lb, both Heribe and Willy said to me that the fish was well over 170lb. My mouth just drop open, I never saw a fish that big before; It was AWESOME and we went back to the spot and did it again untill the tide ran out. Tarpon there, they run real big they say, some local fishing boat that they used to operate in the area told the guide and the marine park that they have fished out of the nets tarpon well over 200/220lb. Oh Yeah, sure. We had Lobster and Snapper for lunch that day it was great. I had the feeling the place was totally unfished, the Bones they were big and strong. They do put on a real fight and average is 6/8lb fish and they were all single/pair fish. I did not see any school of Bonefish feeding. Again in three day fishing at Cayo Cruz every day was a potential GRAND SLAM day, by 9am we already had some kind of sizeable tarpon in the boat and the great thing about the fishing over there was the bonefish were just in the same area of the tarpon, permit,jack,snook,snapper and so on. Suddenly I saw a few permit, they were big but not interested in my fly at all, I guess I just have to come back. Oh did I mention the Blue water fishing for Wahoo,Cubera,Mai Mai and Tuna on the wrecks......??? Maybe another time”. To fish Cayo Romano and Cayo Cruz, you can fly to Cayo Coco with Thomas Cook and drive over the causeway to the hotel on the mainland. Or take a charter to the city of Holguin. If you want to spend some time in Havana, then you can fly from here to Cayo Coco or go overland. Fishing packages are offered of 5 or 6 days fishing with 7 nights in the hotel full board and all transport in Cuba included.